Tomorrow we will bid a last farewell to my late Dad's elder brother, Oom Frans. After my dad and my brother passed away, he was my most closest and most senior paternal relative, and our Pater Familias. I last saw him at Oom Chris's 75th birthday, when he congratulated him on having grown up nicely, and having married the right wife. I last spoke to him just before Christmas when he gave me some useful information and telephone numbers of the "Fish" relatives in Cape Town. 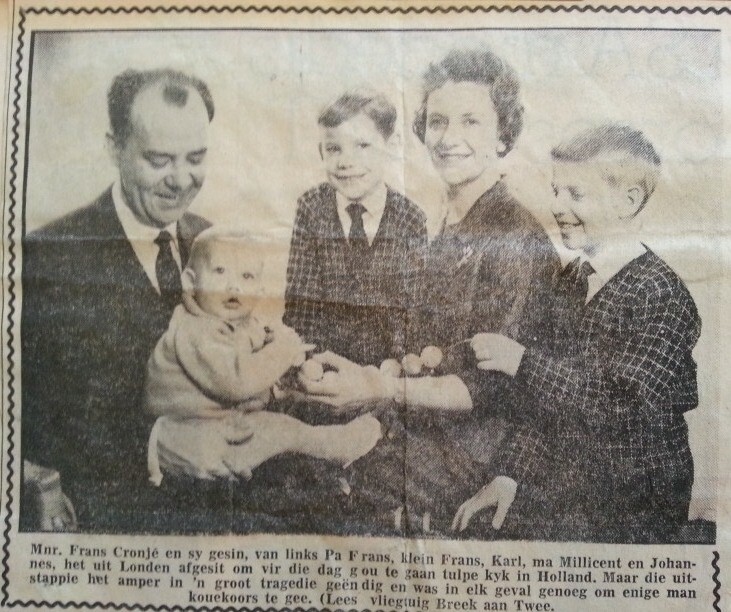 To me Oom Frans was the "GLS" model of my dad. Essentially the same, but with electric windows, leather seats and air conditioning. And I don't use the motor car metaphor lightly. My earliest memory of him is of his family driving away in a grey "Up and Down" Citroen - a car that so fascinated me that I bought an old one for my own son at the beginning of this year. When they returned from their UK posting in the early seventies, they brought along an Austin 11/55 just like ours, but theirs had "inertia reel" seatbelts, and a heated rear window... When they returned from Germany, he had a BMW like my grandfather's, but it had metallic paint. When they returned from Greece, they had a small Mercedes 190 - the only one in Pretoria. Then things went really pear-shaped and he bought a Chrysler Neon, but he redeemed himself by finally getting a Subaru with a bigger racing fin at the back than any other car I'd seen. And then they went away. For six years - my whole primary school life, he and his family were a newspaper cutting in Ouma Bunty's flat at Talisman 116. My fondest memories of Oom Frans and his family are from two or three amazing junior highschool years when I visited them every Saturday. When "Nefie" and I cycled through Brooklyn on the Moulton and the Chopper, when Frans Junior (then Frannie) sang all sorts of songs like "Have you ever gone past an Aston Martin when it's standing still? You will probably find it's talking to a Mini, grill to grill." And Carel had a toy model of Lady Penelope's pink Rolls Royce! Then there were the in-between years when they were away in Germany and Greece. But we reconnected when they returned and they were guests of honour at just about every house party we had at 146 Hugh street. After my father passed away, I really got to appreciate the time he gave me in discussing the old days. Here in Cape Town he took us to Bantry Bay and showed us where Grandfather Fish's house was, and showed us where they swam in the sea and tried to warm it up with boiling water!!! I re-read Grandfater Fish's "Autobiography of a Counterjumper" after seeing his painting in the City Hall; and then I came across the lovely little piece "An evening with my grandson" The baby in that story is the man who passed away - what a sense of continuity. 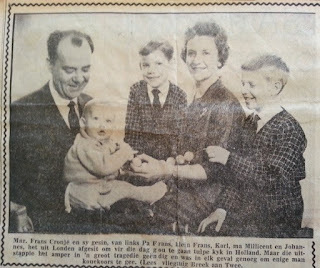 He was also the driver behind the "Familiebrief" in which the five siblings, (and later the four siblings and my Mom) shared their weekly doings, thus keeping such a strong connection despite their huge geographic dispersion. And now he's gone, and so is a significant link to my past. But he will stay in my memory.